I want to tell you about the many stories and voices you’ll find in this special issue. But my mind keeps circling back to Tahlequah. THERE ARE SO MANY THINGS I want to say to you, dear readers, about this issue the Journal’s all-women editorial team has so painstakingly put together. I want to tell you how we envisioned this special, extended edition as at once a celebration of the diverse women across the world who are giving their all to protect our living planet, an acknowledgement of the deep gender biases that still exist within the environmental movement, and a call to arms to keep up the good fight for a better, more equal world. I want to tell you about the many stories and voices you’ll find in these pages that will inspire you, inform you, shock you, make you laugh, and maybe even cry. But my mind keeps circling back to Tahlequah. As you may know, Tahlequah (aka J35) is the 20-year-old Salish Sea orca who refused to let go of the body of her newborn daughter who died within 30 minutes of birth on July 24. The mother killer whale swam around with her baby’s body for weeks on end, even as it was rotting away. For the past two weeks, as we were working round the clock on this issue, I’ve been anxiously following her vigil. Like the rest of the world, I was heartbroken by her pain and worried that if she didn’t let up she would either die of starvation or go mad. Then this morning, I woke to the news that after 17 days, Tahlequah had ended her “tour of grief,” allowing her calf to finally slip away into the depths of the sea. 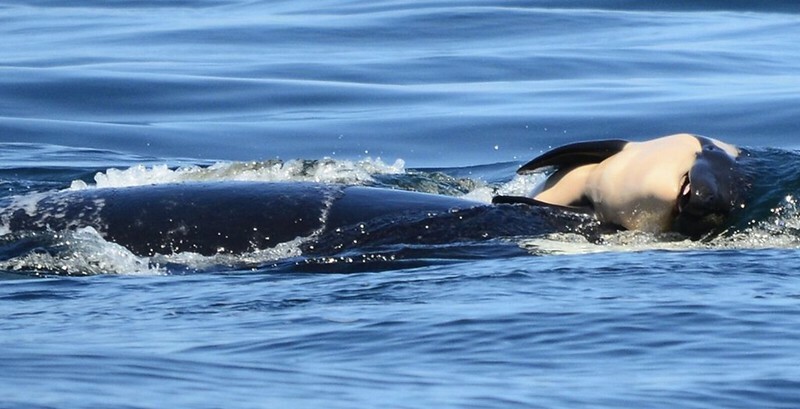 Marine mammal experts say orcas often mourn their offspring this way, but no one has ever witnessed a killer whale carry her infant for such a long period of time. Was Tahlequah trying to tell us something by holding her dead child aloft for us to see for so long? I’m sure I’m not the only one who has wondered. We can’t tell for sure, but based on years of scientific research, we do know this much — orcas are intelligent, socially sophisticated mammals with complex inner lives that we are just about beginning to comprehend. And whether she intended it or not, this mother’s display of grief helped draw the world’s attention to the plight of the critically endangered pod of Southern Resident killer whales that she belongs to. Because of her, we now know that her pod has only 75 members left; that Tahlequah’s baby was the first to be born alive since 2015; that, for some reason — likely inbreeding and the toxic pollution in the Salish Sea, which is contaminated with everything from heavy metals to cocaine — almost all other babies born to this pod in recent years have been male; and that the pod is starving because overfishing and habitat destruction have led to a severe decline in Chinook salmon, their main food source. In Tahlequah’s radical act of grief, I hear a call to all women, to all nurturers, to all those who cherish life: Find your voice. Make your stand. Resist. And, above all, even when darkness surrounds you, keep on. For $15 you can get four issues of the magazine, a 50 percent savings off the newsstand rate.